Celebrating Ramadan and standing up against U.S. imperialism in the Middle East, Muslim-Americans boycott the White House Iftar. 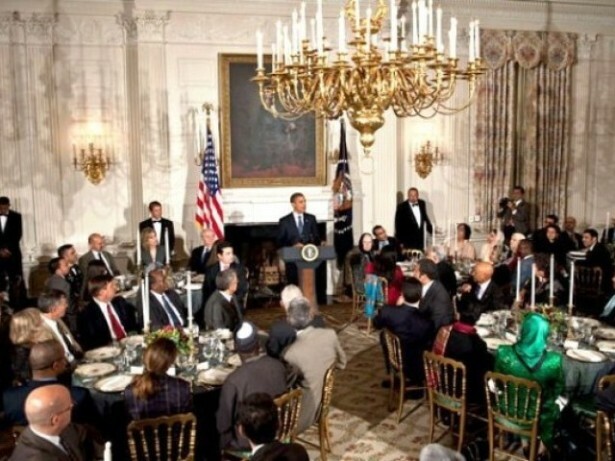 On Monday, President Barack Obama hosted his eleventh White House Iftar, an interfaith dinner breaking the fast of Ramadan with prominent Muslim-American politicians such as Representative Keith Ellison and community leaders from across the country. Former President Bill Clinton began the tradition of White House Iftar as an opportunity for Muslim-American leaders to engage with elected officials about their constituents and communities during the holy month of Ramadan. Although there have been smaller-scale boycotts in previous years, drawing attention to the U.S. wars in Afghanistan and Iraq and the continued operation of Guantanamo Bay Prison, this year several leaders engaged in a public boycott. Citing the continued detention of prisoners without trial in Guantanamo, a recent report from the Intercept on the NSA spying on Muslim-American leaders and the current Israeli bombardment of the Gaza strip as reasons, many voiced concerns that a “seat at the table” is meaningless when the political fates of Muslims around the world and in the United States has already been decided. “Political engagement is important; having a seat at the table is crucial–but only when the seat is intended to amplify our voice as a community, not tokenize or subdue it,” read a statement released by the Arab-American Anti-Discrimination Committee, the largest politically organized group of Arab-American advocacy in the United States, and one of the key organizing groups of the boycott. “Even as we celebrate all that we have in common, we know that in too many corners of the world we see violence and terror, and those who would rather destroy than build,” he addressed the table, a clear nod to the violent escalations in Israel/Palestine. At an event honoring the world’s Muslims, the President openly endorsed a war that has been slaughtering them. Since the beginning of Operation Protective Edge, Israel’s most recent bombing campaign in Gaza, more than 230 Palestinians have been killed, the vast majority of whom were Muslim. In the previous raids on the West Bank, Operation Brother’s Keeper, at least eight Palestinians were killed, and Tariq Abu Khdeir, a Palestinian-American was brutally beaten by the Israeli Border Police. While Obama condemned the kidnapping of the three Israeli teenagers that catalyzed the raids, he never commented on the individual deaths of the Palestinians nor the beating and arrest of Abu Khdeir. Most invitees of the White House’s Iftaar chose not to attend privately, although some, such as Omar Suleiman, Director of the Islamic Learning Foundation in Texas voiced their opposition on Twitter. Protesters, both invitees and activists, picketed the dinner. Some wore orange jumpsuits and shackles, a nod to the White House’s ongoing policies at Guantanamo Bay Prison. Others carried signs drawing attention to President Obama’s complicity in the assault on Gaza. Though they might not have had a seat at the table, they drew far more attention to the human impact of U.S. policies on Muslims, both in the United States and around the world than if they had been behind closed doors.